Russia-backed militants were conducting precision fire from grenade launchers, heavy machine guns, 120-mm and 82-mm mortars as well as from small arms. Militants shelled Ukraine’s Joint Forces’ positions near Troitske, Novoluhanske and Talakivka with 120-mm mortars, attacked the strongholds near Troitske, Luhanske, Svitlodarsk and Hnutove from 82-mm mortars. Russian proxies fired upon the Ukrainian troops defending Troitske and Vodyane from the weapons mounted on infantry-fighting vehicles. A combat engagement took place in Avdiivka on October 15. On October 16 hostile snipers intensified their activities. 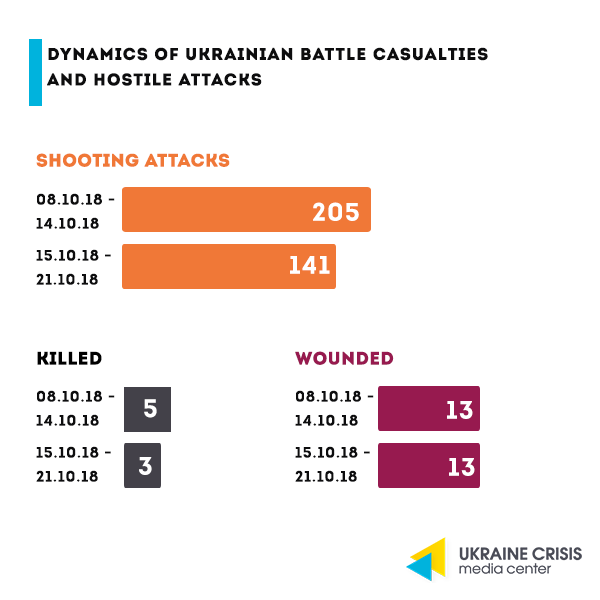 In the evening on October 20 several shots were made with small arms from the uncontrolled area outside Mayorsk control point across the contact line. A tent with civilians inside was damaged. Luckily there were no casualties. Russia’s State Duma (the lower house of the Russian Parliament) released a statement saying that the situation in Donbas is escalating and “a military threat” on the part of the Ukrainian authorities “is mounting”. The statement promises “an adequate response” to the attempts of an offensive. Respective statement was published on the Duma’s web site on October 18. Russian MPs also called the festivities on the occasion of the Defender’s Day that Ukraine marked on October 14 “a neo-Nazi march”. Duma members also complained of the setup of the independent national church in Ukraine calling it an attempt to “ruin the true Orthodox Church” and “sanctify the continuation of the war against Russians and Russian speakers.” “Ukraine has turned into a terrorist state, the leaders of today’s Ukraine are stained with the blood of Aleksandr Zakharchenko and of many other sons and daughters of Donbass,” the Duma statement proceeds. Putin’s comment.The President of the Russian Federation Vladimir Putin is hoping to succeed in building relations and negotiating with the new Ukrainian authorities. “We need to wait until the internal political cycles come to an end. I very much count on being able to build at least some relations as well as to negotiate with the new authorities of the country. We are ready to it and we do want it,” he said speaking at the Valdai forum in Sochi. Ukraine’s Foreign Affairs Ministry reacts. Ukraine’s Foreign Affairs Minister Pavlo Klimkin suggested that the statement by the Russian State Duma “On the escalation of the situation in Ukraine” is to be considered propaganda. 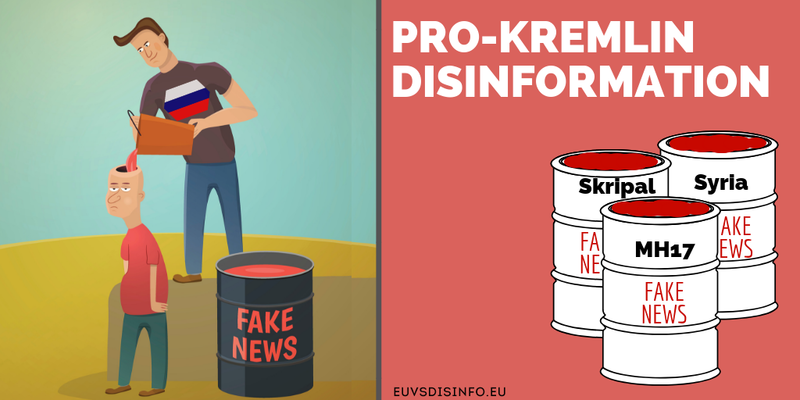 “As to the statement in question by the State Duma, you may want to consider it propaganda. A considerable part of Russia actually lives in the parallel reality,” Minister Klimkin said during his intervention at the National Expert Forum in Odesa last week. The Minister refused to officially comment on the statement in question. “If some alien arrived on the Earth, the one that knows nothing, and the first thing that he reads was the Duma’s statement, they might think that it is not Russia to have occupied part of Ukraine, but actually Ukraine that occupied a part of Russia, that it’s us organizing the terrorist attacks in Russia, that we are supplying Ukraine’s regular troops, weapons and mercenaries there, holding dozens of political prisoners and hostages as well as killing people from Salisbury to Syria,” Minister Klimkin said. 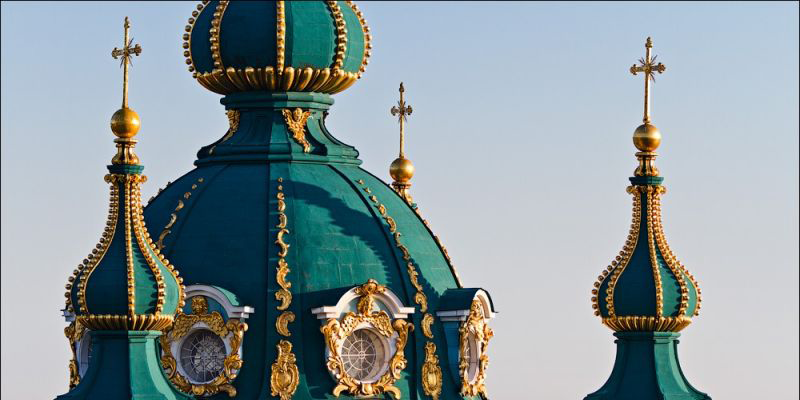 On October 18 the Verkhovna Rada (Ukraine’s Parliament) adopted the draft law submitted by the President that passes the Kyiv-based Andriyivska Church into the use of the Constantinople Patriarchate for the work of its representation office. President Poroshenko emphasized that the move approximates the granting of the Tomos on autocephaly to Ukraine. “Ukraine is back into active communication with the international Orthodoxy. The representative office of the Ecumenical Patriarchate, that is the Mother Church, will help strengthen these ties as well as support Ukraine when the independent autocephalous Orthodox church will be emerging,” President Poroshenko wrote on Facebook last week. 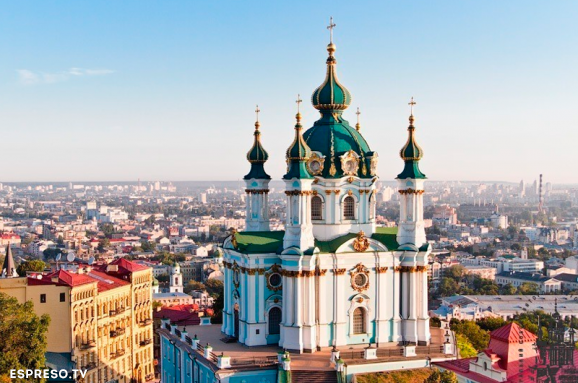 The Andriyivska Church in Kyiv remains state-owned and will further be part of the inventory list of the National Reserve Sofiya Kyivska. According to the press-service of the reserve an agreement on the use of the heritage piece will be signed with the representatives of the Ecumenical Patriarchate. Economy: government approves gas prices increase. What does it mean? On October 19 the Cabinet of Ministers of Ukraine adopted the decision to increase the gas prices for individual consumers by 23,5 per cent. Ukrainians will now have to pay UAH 8.550 (approx. EUR 285) per thousand cubic meters. The main reason behind the decision is the need to continue the cooperation with the IMF and get a new credit tranche. Three hours after the decision was approved the IMF reacted – they said the assistance to Ukraine will be restarted. Thus, an agreement was reached for a new 14-month Stand-By Arrangement worth of USD 3,9 billion. The creditor’s decision was possibly influenced not only by the tariff increase for individual consumers but by the 2019 state budget that the Rada passed in the first reading. A well-balanced budget and gas price increase are the two key conditions that the Fund requested to restart the financial assistance. Two prices for one and the same commodity. Today there are two separate gas supply markets in Ukraine:gas for individual consumers is supplied by gas distribution companies, or the so-called regional gas companies (oblgaz). 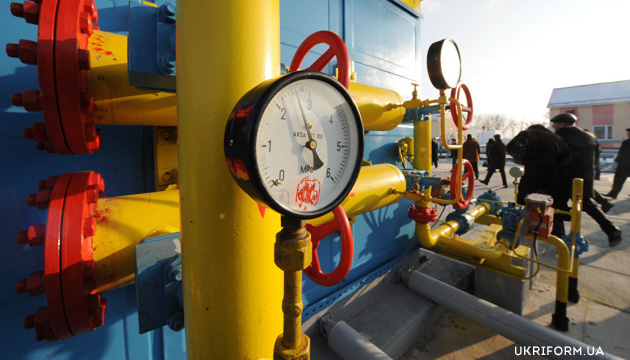 The state is selling them gas via the Naftogaz group at the lower than market prices, so that the cost of the fuel for Ukrainian households used to be much lower than the gas cost for big industrial companies. The decision was made because of the low income of individual consumers. The gas price was often used as a political tool, while the gas price increase has always been inversely proportional to the ranking of the political force that was courageous enough to make this decision. IMF demands: a market price for all. Throughout the cooperation with the IMF gas prices have always been a top issue. The main reason why the IMF is so determined to equalize the prices on gas for individual households and industrial consumers is the money that the government is spending annually to cover the difference in tariffs on the fuel of Naftogaz. The latter is buying gas mostly abroad at the market price. Inefficiency and corruption. Billions of hryvnia are spent inefficiently giving thus a possibility to oblgaz to earn, while most of the oblgaz belong to the runaway oligarch Dmytro Firtash. Regional gas companies are buying gas from Naftogaz for individual consumers at lower then market prices and then resell it to the industry at the market price. The difference between the tariffs stays with the oligarch and is reimbursed by the state, more precisely by Ukrainian tax payers. Equalizing the prices as requested by the IMF will make the above scheme impossible. It is a key indicator that will become a signal for the IMF that the government is ready to actually combat corruption and will not be using its resources that are limited anyway to subsidize the oligarchs. Longtime protraction by the government. The Ukrainian government committed to equalizing the prices for households and industrial consumers already 10 years ago when it cooperated with the IMF to get out of the financial crisis. However it never actually lived up to its commitments. When signing off a new deal with the IMF in 2015 the government also promised to introduce the market price-making on gas for individual consumers. It is probably due to not having implemented the commitment in course of the four-year IMF program worth of USD 17,5 billion that Ukraine received just the half of the sum. Why the IMF tranche is vital? Should the government had refused to increase the prices, Ukraine would not have received the IMF tranche that is first of all required to repay the UAH 112 billion (approx. USD 4 billion) state debt n the first quarter of 2019. IMF is setting the benchmark for Ukraine’s other creditors – the World Bank and the EU as well as for the Western investors who are buying state bonds and are thus lending money to the state. The missing cooperation with the IMF is leading Ukraine to pay a high price already today – the new loans that Ukraine’s Finance Ministry is taking on the international markets have the 7,5-9 per cent annual percentage rate (to compare, the IMF loan has a two per cent rate for Ukraine, while the per cent rate for an EU loan is zero). An unpopular decision. The gas price increase will not go unnoticed for Ukrainians. Spending on utilities is going to increase and the cost of almost all food products will follow. According to the National Bank the 20-25 per cent increase in the gas price will lead to the further one-two per cent price increase of commodities. Even after the increase the gas price for households will remain lower than the market one. Next year the tariffs are going to increase again by 15 per cent at least. The price increase is also going to result negatively on the ranking of the actual government.